The Bake-Off Flunkie: A warm-fuzzies type of moment. A warm-fuzzies type of moment. 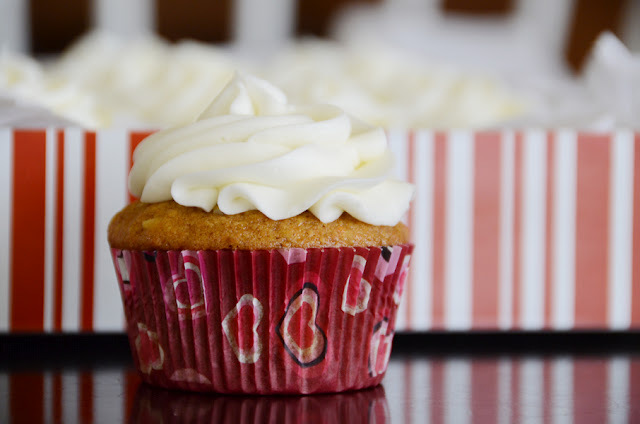 A friend ordered some carrot cake cupcakes with cream cheese frosting from my daughter for her fundraiser, and to my delight, took some pictures and put them on her blog! She also wrote some very nice things about them :) She is a photographer, and took some gorgeous pictures of the cupcakes after I dropped them off this afternoon. She told me later that her husband (her biggest cupcake critic) loved them, and that she needed the recipe. Immediately. Sounds like I should share my carrot cake recipe, yes?? Here's a little taste of her amazing picture-taking talent, and you can read her post HERE. Mmmm...I happen to have about 10 pounds of carrots that Alan dug out of the garden over the weekend. Post the recipe STAT, would you? !